Daughter of Robert Kennedy. Cousin of JFK Jr. Oscar-nominated documentarian and Malibu resident Rory Kennedy has a long list of producer and director credits going back to 1999, and including the Academy Award-nominated Last Days in Vietnam (2014), which she shared with Keven McAlester. Rory is a Kennedy, which means she has the family passion for public service, helping those in need and bringing issues into the light. Over her career Kennedy has produced and directed documentaries about topics from AIDS to The Nazi Officer’s Wife. So why did a socially-conscious Kennedy spend a year making a documentary about a surfer? 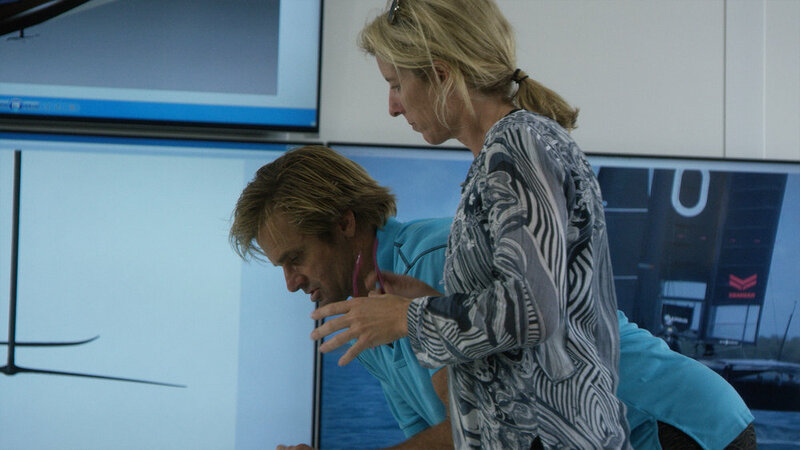 Laird Hamilton and Rory Kennedy conferring on the documentary she made about him. Yeah I’m on the North Shore right now. I’m actually working on a book with Buzzy Kerbox. Buzzy’s great. He’s the best. Yep, he’s a good guy. Don’t hate him because he’s handsome. The funny thing about Buzzy is, as we were working on the book and had to define his look... How did this Hawaiian surfer dude end up as an East Coast preppy and a major model for Polo? And well, Buzzy looks like one of your tribe, clan, ohana. He’s Kennedyesque. I know, we’ve made that connection before. It’s very funny and he does look like one of us. Are you in Malibu right now? Last night I watched Gimme Shelter and the long, almost four-hour version of Woodstock. Those are both influential documentaries and I wonder what inspired you to become a documentarian? Which documentaries and which directors? Well early on I was pretty inspired by the sort of verite documentary filmmakers: Barbara Kopple,. D.A. Pennebaker. That kind of group of people who didn’t really focus on telling stories as they unfolded in front of them as opposed to historical, talking head interviews. So I would say that kind of inspired me but I think over the years there have been lot of amazing documentary filmmakers who have emerged, who continued to blow me away with their films and their abilities. And I’m really proud to be part of the documentary community. I was just going to say that I’ve watched a lot of documentaries and a lot of surf documentaries, and your Laird story is very good, because you had a lot of ground to cover. It’s an elaborate story and the way you structured it and it jumps back and forth but I would say you nailed it. I know that material pretty well from working at Surfer Magazine for 10 years, and you didn’t leave out much. How long was the longest cut at one point? You know the editing is always a process so you certainly start at some point with like a four-hour cut and then you try to figure out where the film is and carve away at it until you get down to the bones of it. But there was certainly a lot of material that ended up on the editing room floor that was also exciting and compelling stuff. I call the editing process “the one yard stare.” You have that equation in your head and you live with it and you sleep with it and it’s nice when it’s done. Do you think you will ever release a Director’s Cut of Take Every Wave that shows everything? No. I think it is what it is. And I think that’s what it will be. You’ll have to live with the cuts and the edits and I really don’t have any regrets or feelings of, you know... The truth is the film is about an hour and fifty minutes so it’s solid. It’s solid. It’s pretty solid. 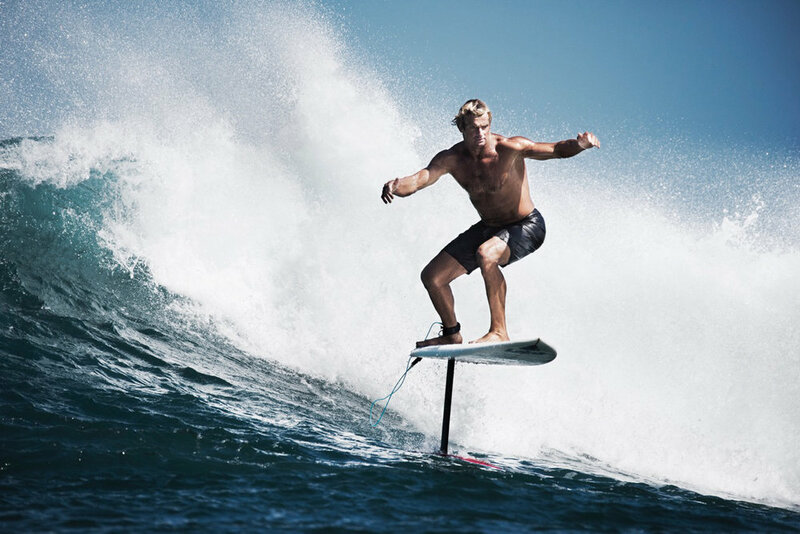 Although you didn’t include anything about standup paddling and in a way that is where Laird’s influence is worldwide. It’s not hard to argue that Laird was the Johnny Appleseed of modern SUP and it’s now… I asked Laird a year ago: “Is it a billion-dollar industry yet?” And he said, “Well I don’t know about now, but maybe next year.” There was no temptation to include SUP in this documentary, or there wasn’t enough room? Well it was a struggle for us because you know I really appreciate what that contribution is and what it means and how many people it has impacted. But the problem is in a documentary like this you’re trying to tell a story, and we wanted to focus on a story that was pretty exclusively about big waves and his big wave passion and career. And it didn’t… I mean I have a scene, a paddleboard sequence that we did, and it was good, but it didn’t fit anywhere in the film. You know, it kind of stopped the energy of the film in a way? You think, ‘Well where would you put it? And it doesn’t really go in this film.’ You know there’s different kinds of… We’re not telling a biography per se, we’re telling a story. About a person. A little bit of a different way of thinking about it. So the title, Take Every Wave, will inspire some snickering in Malibu where Laird is more or less popular. Where did that title come from? Was it debated and were there other title possibilities? We discussed a number of different titles along the way. I liked this title… you know I think that the film. Listen I think Laird got to where he is today by being really good at what he does and with a little bit of sharp elbows. It’s not necessarily a smooth path. And there was a cost to his ability to have so many extraordinary breakthroughs. And I wanted to make a film that explored those in depth and wasn’t just a kind of love story for Laird, right? So it’s a little more nuanced and complex, I like to think. It’s honest. Sometimes a little brutally. I felt that title works on both levels where if you’re a surfer, to take every wave means that other people can’t take that wave. Right? No, surfing is an aggressive, macho, ego-driven, sometimes selfish world. No doubt about it. So I appreciate that it would have a certain read in that world. On the other hand it has a kind of Climb Every Mountain message. More aspirational. It’s actually interesting because if you say that title to non-surfers, that’s the only read they have - that it’s much more aspirational. But surfers understand that it’s more nuanced. But that kind of works for us, because we want to pull in the non-surfers and have them feel like they’re going to get something that they’re excited about. But for the surfers I think that Laird is a controversial figure and will this film take on that controversy? May make it more appealing to that audience. So it works both ways. When the BLAME LAIRD campaign was going around Malibu, in protest of the SUP flooding every nook and cranny, I believe Laird bought the name and started selling those shirts and stickers himself. There’s a saying: “If they’re running you out of town, get at the head and call it a parade.” Laird kind of goes by that. He don’t like to be afraid: Of waves, or controversy. So he meets it. Well Laird was fine - we had editorial control of the film - but he understood the title and he approved the final. So you hear this and that about Laird: He’s arrogant, he’s selfish. But I’ve interviewed him a few times and I think he’s fine. He’s so pretty and he’s such a musclehead you expect him to be Lance Burkhart - a dickhead and a dolt. But he’s definitely not a dolt. Were you surprised by how bright he is? You know part of the appeal of the film…. 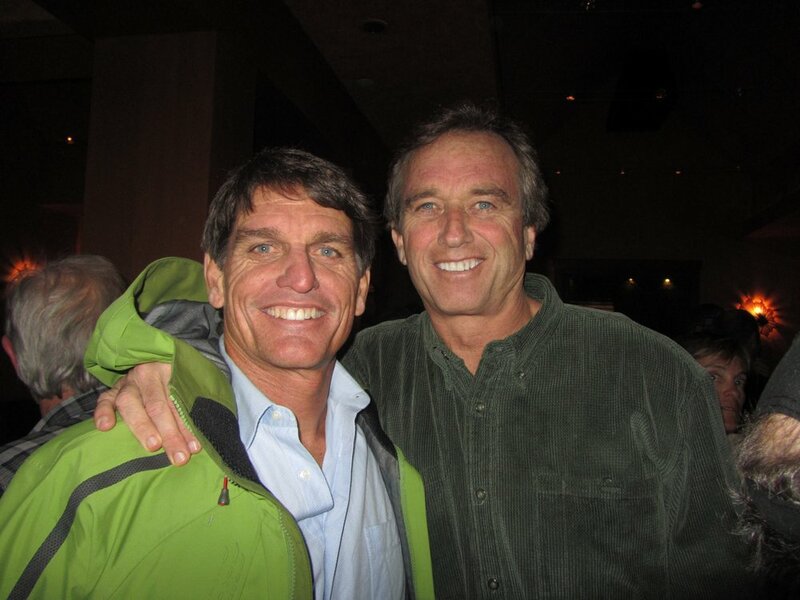 Honestly when I first met with Laird to talk about doing a film, I unusually had a lot of reservations: I don’t want to make a surf film and I don’t really know Laird and I’m not sure what the story is here, you know? I love surf films, don’t get me wrong, but I wasn’t sure I wanted to spend a year making a film about some guy surfing on waves and that’s that. You know I want to tell stories and say something that’s meaningful. But as I spent more time with Laird I came to appreciate what he has contributed and… his intelligence and his individuality. Yeah, force of personality, exactly. And that was ultimately what drew me to decide to make this film. Wikipedia says you moved to Malibu in 2013. Did you know Laird before or meet him from living in Malibu? I met him a couple of times. We live not too far from each other and then as the years went on and we had mutual friends. I met him but I didn’t know him well and didn’t have a relationship with him per se. Our mutual friend Paul Speaker who also lives in Malibu connected us with the idea of making a documentary. It was really Paul Speaker’s idea and drive. He brought us together and then Laird and I met each other and spent some time and ultimately decided to make this film. When did this all begin? What was the first spark? Do you remember? We had lunch together and polished up the idea and I wasn’t quite sure what to do with it. And then there were a lot of other films that were of interest to me and there were a lot of other things going on in the world at the time. You know there was issues with African Americans being killed by the police and many things on the nightly news. I actually decided not to do the film and wanted to focus on some of these other social issues. So I said no. I passed and then as soon as I passed I couldn’t get it out of my head. Part of it was Laird and his story and I got to know that more and I really do have this deep love of the water and nature and all it involves and to be able to spend time with somebody who was really committed to that and also someone who in my mind was the best at what they were doing. I couldn’t really let that go. They were nice enough to keep the door open for me so we started over again and spent some time developing and doing more research. When did you actually start? How long ago was that? Ummm I guess it was a year ago last summer. So I don’t know. Two years ago? I’ve lost all track of time. It premiered at Sundance this past January and we finished it that fall so it was a year before that. PR person: I’m sorry Rory only has a minute left so if you could ask some final questions, that would be great. Okay when Laird was listed in People Magazine’s 50 Most Beautiful People, Gabby said about the nicest thing a wife has ever said about a husband: “He’s beautiful when he’s in motion.” Do you agree with that? Do I agree that he’s beautiful when he’s in motion or is that the nicest thing a wife has said about a husband? I understand why Gabby would say that. You know I think I would refine it to say, “He’s beautiful when he’s on the water.” You know, when you see him out of the water he definitely seems to feel like a fish out of water, as they say. There’s something very natural when you see him in the ocean. I was out surfing in the spring - no actually the fall - and he kind of went by on his foil board. There were some pretty big waves and he looked so happy and natural and joyful and in his element. You really feel this is where this guy should be. You can see him from a mile away. Anything else you want to add? Anyone you want to thank? No I think I would just say the film is coming out in theaters on September 29 and we really appreciate people taking the effort to go down and get out there and support it. And the more people go see it, the longer it will stay. It’s hard to get films out in theaters these days and it’s hard to see a documentary but I do feel that this film more than any of my films wants to be seen on the big screen. It’s an experience and I would encourage folks to go out there. 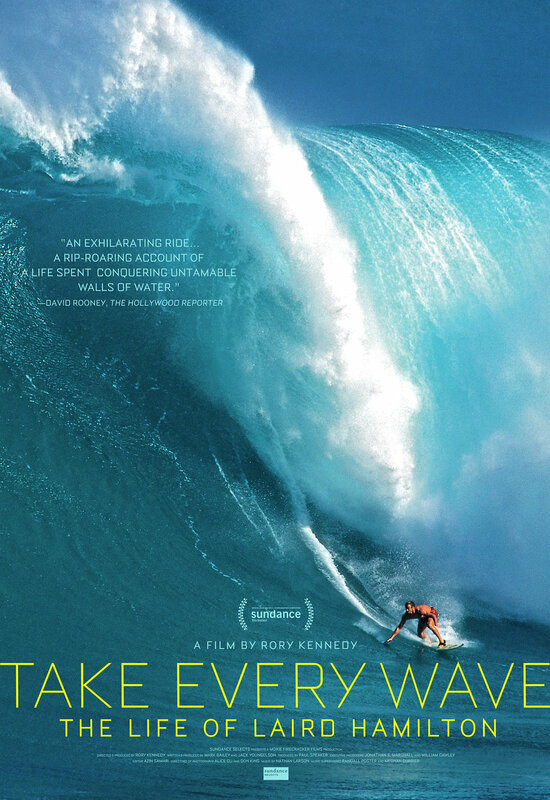 We have a website called takeeverywave.com which has a list of screenings. Oh and say hi to Buzzy for me.